Companies are using virtual reality technology to demonstrate what it feels like for patients when they encounter medical conditions. Virtual Reality (VR) allows a user to discover and interact with a three-dimensional (3D), computer-generated environment in a seemingly real or physical way. The only way a user can experience VR is through a head mounted display (HMD). Many HMDs contain headphones/ speakers so that the user can receive sensory inputs in the form of audio. The individual also has the option to interact/move around in the virtual experience through input devices such as motion controllers. VR is not a new concept; it’s just that when it was first introduced into the world, the technology to support it or help it go mainstream was very expensive. Now-a-days with the introduction of faster, smarter, cheaper and immersive technologies, users are adapting their consumption habits to accommodate such a technology. VR can be a powerful platform for organisations to build and enhance their customer/user experiences. VR as a technology is considered to be typically associated with gaming. However, VR is being used across various other industries. With the increase in popularity of a variety of VR headsets, the likes of Facebook’s Oculus Rift, HTC Vive, Google Daydream and Samsung Gear VR to mention a few, VR is going to affect industries far and wide; from healthcare and education to entertainment and commerce. 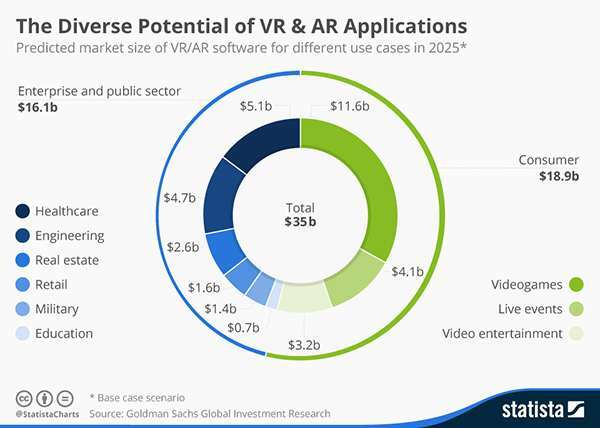 Research done by Goldman Sachs Global Investment , showcases the predicted market size of VR and AR software across multiple industries. The healthcare industry is one of the biggest adopters of VR, as organisations in this industry are teaming up with technology companies to create specialised VR softwares that can encompass simulations in the form of experimental surgery, phobia treatment, pain management, skills training, etc. Medical professionals, who adopt VR technology, also acquire the ability to learn new skills, as well as refresh existing ones when dealing with patients in multiple scenarios. Evoking empathy – Healthcare companies are currently using VR technology to demonstrate what it feels like for a child/ patient when they encounter medical conditions such as migraines, vertigo, etc. On wearing the VR headset, relatives/ friends of the patient get a first-hand experience of what the patient is suffering through when these conditions are triggered. Training/treatment for autism – Autism is a developmental condition in which the person experiences difficulties in communication with other people. Healthcare organisations are using VR technology to help autistic children develop the skills necessary for their independence and make sense of the world around them. For example, an autistic child finds it difficult to read facial expressions or pay attention to someone while they are speaking. By creating such virtual scenarios (experienced through the HMD), professionals give children step-by-step instructions on how to deal with the situation that is presented in front of them. Moreover, there is the added bonus as they are experiencing this in a safe and secure environment. Pain management – Doctors are using distraction therapy via VR to help patients get a handle on the pain they suffer during treatment. An example of this is for burn victims, for whom pain is an on-going issue for tasks like wound care or physical therapy. Doctors use a VR simulated game/experience that overwhelms the senses and pain pathways in the brain, thus creating a distraction for the patient. VR therapy through exploration – Children who suffer from serious medical conditions, sometime end up spending weeks, if not months, in the hospital. Various companies are using VR technology to give such children a chance to escape from the mundane environment they witness at hospitals. By allowing the children to go on excursions, or visit virtual zoos and interact with the animals, the experience creates a distraction for the children where they wouldn’t feel like they are in a hospital bed all the time. Virtual reality can be viewed as an assistive technology, due to its potential to minimise or offset the effects of a medical condition and provide an alternative means for a child to accomplish a particular task. VR is still in its initial stages, and has still not been adopted by many healthcare organisations. 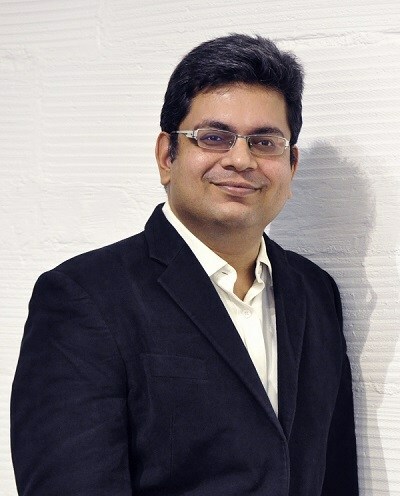 There is a growing market for immersive tech, and with the promise of VR applications, healthcare organisations in India should leverage these tools as it will not only help them save time and money, but also bring about a transformation in approaching ideas/ experiences that could possibly disrupt the current business landscape.